Interesante estudio sobre la efectividad del empleo de drones en campañas contrainsurgencia y contraterroristas. Artículo de la Revista Española de Defensa sobre las nuevas caras de Al Qaeda. Dos años después de la desaparición de Bin Laden, la organización terrorista es mucho más poliédrica y basa su fuerza en diversos organismos regionales con líderes locales. ¿Qué sabéis sobre las raíces del al Qaeda, en qué bases se apoya su ideología...? Emiratos Arabes Unidos ha publicado su lista de organizaciones terroristas. Al menos 10 las marca en Europa. :: The UAE Muslim Brotherhood. :: Al-Islah (or Da'wat Al-Islah). :: Associazione Musulmani Italiani (Association of Italian Muslims). :: Khalaya Al-Jihad Al-Emirati (Emirati Jihadist Cells). :: Osbat al-Ansar (the League of the Followers) in Lebanon. :: The Finnish Islamic Association (Suomen Islam-seurakunta). :: Al-Qaeda in the Land of the Islamic Maghreb (AQIM or Tanzim al-Qa idah fi Bilad al-Maghrib al-Islami). :: Ansar al-Sharia in Libya (ASL, Partisans of Islamic Law). :: Det Islamske Forbundet i Norge (Islamic Association in Norway). :: Ansar al-Sharia in Tunisia (AST, Partisans of Sharia) in Tunisia. :: The Cordoba Foundation (TCF) in Britian. 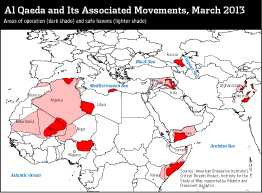 :: Al-Qaeda in the Arabian Peninsula (AQAP). :: Boko Haraam ( Jama'atu Ahlis Sunna Lidda'Awati Wal-Jihad) in Nigeria. :: Islamic Relief Worldwide (IRW) of the Global Muslim Brotherhood. :: Jama'at Ansar al-Shari'a (Partisans of Sharia) in Yemen. :: Al-Mourabitoun (The Sentinels) group in Mali. :: Tehrik-i-Taliban Pakistan (Taliban Movement of Pakistan). :: The Muslim Brotherhood (MB) organisation and groups. :: Ansar al-Dine (Defenders of the faith) movement in Mali. :: Abu Dhar al-Ghifari Battalion in Syria. :: Jama'a Islamia in Egypt (AKA al-Gama'at al-Islamiyya, The Islamic Group, IG). :: The Haqqani Network in Pakistan. :: Al-Tawheed Brigade (Brigade of Unity, or Monotheism) in Syria. :: Ansar Bait al-Maqdis (ABM, Supporters of the Holy House or Jerusalem) and now rebranded as Wilayat Sinai (Province or state in the Sinai). :: Lashkar-e-Taiba (Soldiers, or Army of the Pure, or of the Righteous). :: Al-Tawhid wal-Eman battalion (Battalion of Unity, or Monotheism, and Faith) in Syria. :: Ajnad Misr (Soldiers of Egypt) group. :: The East Turkistan Islamic Movement in Pakistan (ETIM), AKA the Turkistan Islamic Party (TIP), Turkistan Islamic Movement (TIM). :: Katibat al-Khadra in Syria (The Green Battalion). :: Majlis Shura al-Mujahideen Fi Aknaf Bayt al-Maqdis (the Mujahedeen Shura Council in the Environs of Jerusalem, or MSC). :: Jaish-e-Mohammed (The Army of Muhammad). :: Abu Bakr Al Siddiq Brigade in Syria. :: The Houthi Movement in Yemen. :: Jaish-e-Mohammed (The Army of Muhammad) in Pakistan and India. :: Talha Ibn 'Ubaid-Allah Compnay in Syria. :: Hezbollah al-Hijaz in Saudi Arabia. :: Al Mujahideen Al Honoud in Kashmor/ India (The Indian Mujahideen, IM). :: Al Sarim Al Battar Brigade in Syria. :: Hezbollah in the Gulf Cooperation Council. :: Islamic Emirate of the Caucasus (Caucasus Emirate or Kavkaz and Chechen jidadists). :: The Abdullah bin Mubarak Brigade in Syria. :: The Islamic Movement of Uzbekistan (IMU). :: Qawafil al-Shuhada (Caravans of the Martyrs). :: The Badr Organisation in Iraq. :: Abu Sayyaf Organisation in the Philippines. :: Abu Omar Brigade in Syria. :: Asa'ib Ahl al-Haq in Iraq (The Leagues of the Righteous). :: Ahrar Shammar Brigade in Syria (Brigade of the free men of the Shammar Tribe). :: Hezbollah Brigades in Iraq. :: CANVAS organisation in Belgrade, Serbia. :: The Sarya al-Jabal Brigade in Syria. :: Liwa Abu al-Fadl al-Abbas in Syria. :: The Muslim American Society (MAS). :: Al Shahba' Brigade in Syria. :: Liwa al-Youm al-Maw'oud in Iraq (Brigade of Judgment Day). :: International Union of Muslim Scholars (IUMS). :: Al Ka'kaa' Brigade in Syria. :: Liwa Ammar bin Yasser (Ammar bin Yasser Brigade). :: Ansar al-Islam in Iraq. :: Federation of Islamic Organisations in Europe. :: Sufyan Al Thawri Brigade. :: Ansar al-Islam Group in Iraq (Partisans of Islam). :: Union of Islamic Organisations of France (L'Union des Organisations Islamiques de France, UOIF). :: Ebad ar-Rahman Brigade (Brigade of Soldiers of Allah) in Syria. :: Jabhat al-Nusra (Al-Nusra Front) in Syria. :: Muslim Association of Britain (MAB). :: Omar Ibn al-Khattab Battalion in Syria. :: Harakat Ahrar ash-Sham Al Islami (Islamic Movement of the Free Men of the Levant). :: Islamic Society of Germany (Islamische Gemeinschaft Deutschland). :: Al-Shayma' Battaltion in Syria. :: The Islamic Society in Denmark (Det Islamiske Trossamfund, DIT). :: Katibat al-Haqq (Brigade of the Righteous). : The Abdullah Azzam Brigades.